Wintertime provides a great opportunity to pick out trees, bushes, and fence posts that need to go. But frozen ground means those jobs have to wait for another day. For those of you waiting for the ground to thaw, patiently or not, these tips will prepare you to get the most out of your skid steer tree puller. The operating capacity of your skid loader is the most important limiting factor when it comes to pulling objects from the ground. The higher a machine’s operating capacity, the heavier the objects that can be pulled. Small trees (1-3” diameter) are usually a non-issue and are easily pulled out at the base. Larger trees (4” or more in diameter) will require more power and could become a problem. Additionally, we recommend using a skid loader that has a door on its cab. The door will help keep tree limbs and roots from coming into the cab. Marking your work area with flags indicating where any underground utilities run is a good habit to build. Next, check for overhead obstructions and place orange warning signs under overhead electrical power lines to indicate any potential dangers above. If you’re working in a tighter space or residential area, ensure you have enough physical space to transport the root systems of the trees you’re pulling. Remember, a 15-foot tree can easily have a 10-foot root system. 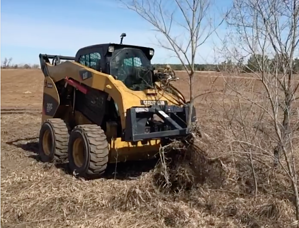 The maximum size of tree or post that can be pulled by a tree puller attachment will vary depending on soil condition, diameter and species of the tree, and operating capacity of the skid steer you’re using. Sandy soils are going to release root systems more easily than tougher, clay-like soils. Drier ground typically leads to deeper roots as trees are reaching farther to get the moisture they need. Individual tree species have different root systems as well. For example, white oaks, hickories, and walnuts are all known to have strong and deep taproots. Knowing the species can be helpful when it comes time to start removing unwanted trees. First, lower tree puller and level jaws until parallel with the ground and know that the strongest point of the tree is closer to the ground. Pull as low on the base as you can to prevent breaking or snapping. Open the jaw and drive forward until the item to be removed is between the jaws, as close to jaw hinge as possible. Close jaw and begin pulling. 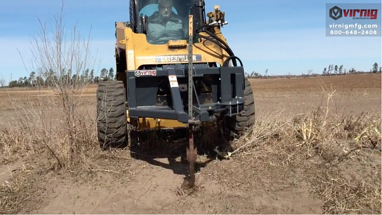 When pulling posts, position the stationary jaw as close to the post as possible, and close the second jaw to the post (this method will help you to avoid bending small posts). I f pulling bigger trees or posts, rock the object back and forth before pulling up. The side-to-side movement helps loosen roots. With loosened roots, you have a better chance of effectively removing the root system. Please note that some trees may require the roots to be excavated. As the item being pulled starts to loosen from the ground, reduce pulling force to avoid the item popping from the ground, which can cause instability. Once the tree is free, shake it in place to remove excess dirt. The excess dirt will fall back into the hole, leaving behind a cleaner finished product and less work for whoever is tasked with filling in the holes. Do not use a tree puller on items that need to remain unmarred. Tree pullers will, at a minimum, leave marks on the items they remove. For instance, if you have decorative posts you’re hoping to reuse, a tree puller might not be the best choice. Wooden posts will become dented, and metal ones may bend. As conditions allow, clear several small trees in one go by accumulating them inside the jaws of the attachment. This will help you complete a large clearing job more quickly and efficiently. Always use caution when transporting items in the tree puller. The load causes greater instability. Transport items as low as possible. Tilt the tree puller forward slighting so that the top of the item you’re transporting is leaning away from the loader. This will help keep branches and debris out of your way while increasing overall visibility. Also, as mentioned above, be aware of overhead power lines! Grease hinge pin and cylinder pins (on the Virnig Tree Puller there are four grease fittings total). Inspect cylinder, hydraulic fittings, and hoses for leaks and damage. Replace as needed. Make sure skid loader is shut off and hydraulic pressure is relieved before checking for leaks. Never use hands to check for high-pressure hydraulic leaks. Check that all cylinder and hinge pins are secure. Check for loose, worn, or missing parts. Repair or replace as needed. Contact your dealer for replacement parts. Replace illegible or missing safety labels by obtaining new labels from your dealer. When they’re used properly, tree puller attachments can make quick work out of an otherwise difficult job. By using these tips, your next job will take less time and effort. Plus, these tips will keep you and your equipment safer.